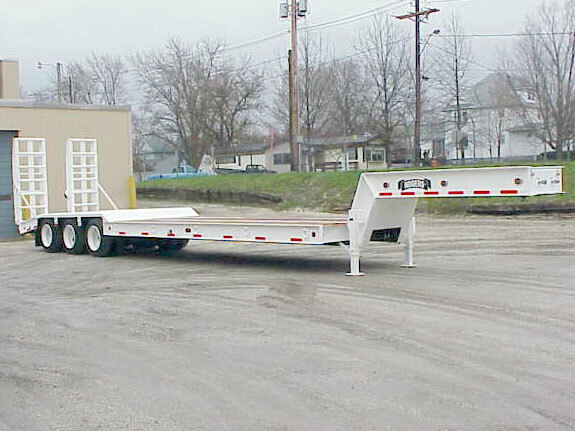 This 35-ton fixed gooseneck trailer has pin type landing gear, 22'-0" deck and hydraulic powered ladder-style ramps. Customer specified additional clearance lights on the sides of the deck and gooseneck, and ROGERS white color finish. The deck has 2" air-dired oak, and the rear frame has reinforced 3/8" tread plate wheel covers. Air ride suspension has mechanical height control that can adjust the deck ± 1" to 3". The rear ramps (96" L x 36" W) are attached to the 48" beavertail and provide a 10° loading incline. The hydraulic ramps are powered by the tractor's PTO, and the control is in the beavertail (on left). The control for the air lift on the 3rd axle is also located in the beavertail (on right).